July 8th, 2015I visited Funagata Port for the first time in six years. No specific change of the environment. The berth below becomes the official visitors berth by the local government, a yacht club guy says. Shiosai Inn is alive. Atarashi-ya fish shop located just before Shiosai Inn kindly slices raw fishes, i.e. makes Sashimi, when you buy fishes. Move close to the eastside beach until you look at the white light house of Funagata Fishing Port, 35 01.300N　139 50.720E, on your due north. Then turn due north. You will see the red lighthouse further inside of the white lighthouse Moving close to the red lighthouse, the yacht berth inside Negishi breakwater comes into sight. Free for a less than three day stay. From the day four, the fee is JPY42/tonnage/day. Many sail boats are mooring bow-to lining up from the back of the breakwater. 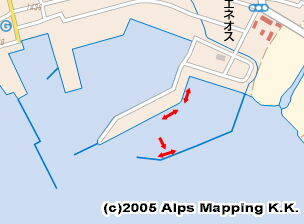 Between the front mooring boat and around a bend before the end of the breakwater, there is space for four visitor boats mooring bow-to. Or, two boats can moor along-side. When I arrived the port, I felt it was a very quiet port. But, as southwesterly wind got stronger just after my arrival, waves rippled and the boat started rolling harder. It lasted for two days. The waves might had swells. As the port opens to west, you have to be prepared a strong rolling with westerly wind. A bow-to mooring boat faces westerly wind and wave from the side. Water and a toilet are five minutes away in a park next to Fureai Market. There is a big coin laundry 20 minutes away. Walk through the road along Gakeno Kanon and hit a beach to find the coin laundry. Shiosai Inn, phone 0470-27-2860, with a bath is a comfortable place. When I visited, the bath was available from 5pm for JPY600. A local big supermarket, ODOYA, is 10 minutes away. 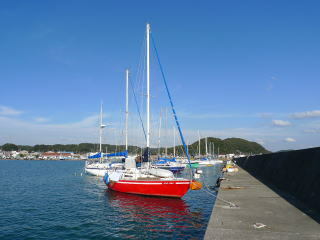 It is next to Chiba Bank with a red signboard, which can be seen from the port. There are some fish shops. I didn’t check the availability of fuel.